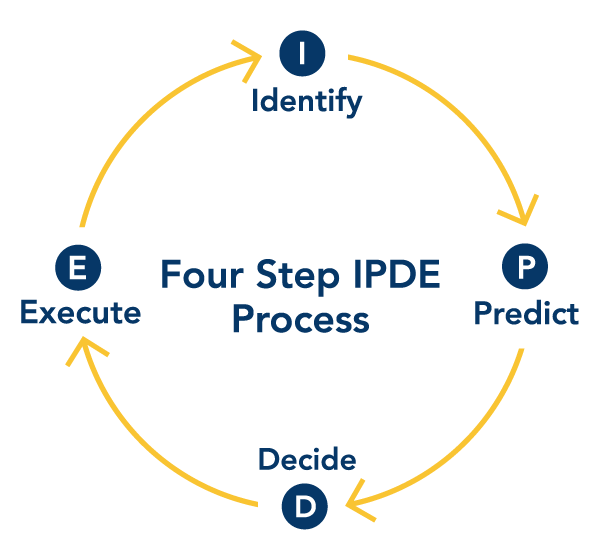 IPDE stands for Identify, Predict, Decide, and Execute. This is the step-by-step process behind the principles of defensive driving and complexities of visual perception in traffic. Driving is such a regular and routine part of our lives that we’re often figuratively asleep at the wheel. IPDE demands the driver engage in the strategic thinking and acting process when driving a vehicle. 1. I—Identify—Locate potential hazards within the driving scene. In the first step of the IDPE process, the driver should survey the surrounding area for potential obstructions and deteriorating weather conditions. From approaching cyclists to a stopped vehicle parked curbside, identifying potential hazards is crucial to maintaining safety. 2. P—Predict—Judge where the possible points of conflict may occur. It is important that drivers remain alert and actively attempt to predict other driver’s actions before they occur. Anticipating other driver’s movements allow you to formulate a proper response. 3. D—Decide—Determine what action to take, when, and where to take it. If you anticipate a driver to change lanes or abruptly brake, think through an adequate response. Should you put more space between you and the other driver? Should you communicate to the other driver by utilizing your horn? 4. E—Execute—Act by maneuvering the car to avoid conflicts. With due caution, execute your decision. Decide swiftly what response is most appropriate for the situation in order to ensure your safety and the safety of those around you. The responses could include braking, accelerating, or a combination of multiple actions to safely navigate the situation. The IPDE process can help you avoid collisions and is an ideal practice to become a proficient defensive driver. This is an excellent system that drivers can learn to implement instinctively and almost instantaneously when faced with a possibly dangerous situation on the road. Ask an instructor at Top Driver if the IPDE method is right for you. If you’re interested in improving your driving knowledge and becoming a more proactive driver, contact Top Driver today or sign up for an online driving course. This entry was posted in Top Driver Blog and tagged Avoid Collisions, Driver Safety, IPDE Driving Process, Proactive Driving.